Home » How to Manifest » 5 Morning Rituals that can Make Your Life Better! 5 Morning Rituals that can Make Your Life Better! Do you press the snooze button several times before getting up? Do you check email as soon as you get out of bed…or even before? Do you complain before you've gotten dressed for the day? If any of these sound like you, it's a clear sign that you need a new morning ritual – one that will help you put more spark into your day and get the Law of Attraction working in your favor! A good morning ritual helps you get off on the right foot, not just for the rest of your day, but for your life. While it's okay to press the snooze button and to check email, starting your mornings off with them can cause stress and negative thoughts, dropping your vibration and taking you out of alignment with your heart's desires. Even better – a morning ritual that starts your day by raising your vibration will help increase your happiness, productivity, and success. 1. Begin with gratitude. It's so easy to begin thinking about how much you don't want to get out of bed…and about all the things you need to do for the day, that you forget what a miracle it is to be be alive and wake up for another day. 2. Smile. Smiling is a great way to quickly raise your vibration. It reduces stress and helps you to feel better. It doesn't matter whether you're a cheery morning person or naturally grumpy until noon. Smiling is a Law of Attraction morning ritual that can change your life. 3. Stretch. If you've ever seen a cat or a dog wake up, the first thing they do is stretch as deeply as they can. It's a beneficial morning ritual for people too. Stretching helps wake up the mind and body, releasing any leftover fatigue. You don't have to do anything complex if you don't want to. Just some simple stretching: reaching your arms up as high as you can, making yourself even taller than you thought you could. Rotating your neck from side to side (remember to be gentle). Bending at your waist and touching your toes, keeping your knees relaxed. Or you can consciously decide what you intend to happen. When you decide how you want your day to go, you take control of your life and make the Law of Attraction work for you. 5. Let go of yesterday. If any concerns or worries about what might have happened yesterday come up, just let them go. The past is in the past. Today is a new day. You can start fresh and handle anything that comes your way. 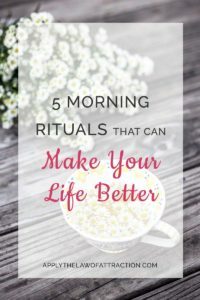 I hope these morning rituals help you to make your life better, going through your day with more ease and happiness, while seeing more success with the Law of Attraction. If you have any morning rituals that help you, please share them with everyone in the comments below. How I Manifested a House – Selling and Buying a New One Fast! How do we turn negative morning thoughts to positive? You do this by putting the way you feel on the first place. You want to feel great always, no matter what. You want to be excited, in love with life. The more you focus on feeling good, the less negative thoughts pop into your mind, because like attracts like. If you vibrate on a higher frequency you will attract to you all things that resonate with that frequency. Feel good by laughing out loud, smiling, listening to upbeat cheerful music, by eating the right healthy food, by getting outside every day, by avoiding to watch negative clutter on TV. By visualizing about all what makes you happy. And so on, there is so much what helps you feel better and better, 1 step at a time. Believe in yourself. I know you can do it if you want it!